The Stenhammar Quartet was founded in 1995. The members are Peter Olofsson and Per Öman, violins, Tony Bauer, viola and Mats Olofsson, cello.Their warm and energetic musicianship together with striking technical refinement have given them a position as one of the most interesting and respected quartets in Scandinavia today. Tours in Sweden as well as invitations to many chambermusic festivals have brought the quartet to England, Polen, Germany, Denmark, Algers, Finland and India during last years. In 2010 the quartet made it’s debute in London and was reinvited for 2012. The main emphasis of the repertoire is on Swedish music, but, needless to say, the international repertoire is of course also included.New music has a special place for them and they have commissioned and premiered quartets by Mats Larsson-Gothe, Per Mårtensson, Mika Pelo, Viktoria Borisova-Ollas ao. Their release in 2008(Daphne records) with music by Lars-Erik Larsson including the first ever recording of ”Late Autumn Leaves” recieved fantastic critics and was nominated for a Swedish Grammyaward. 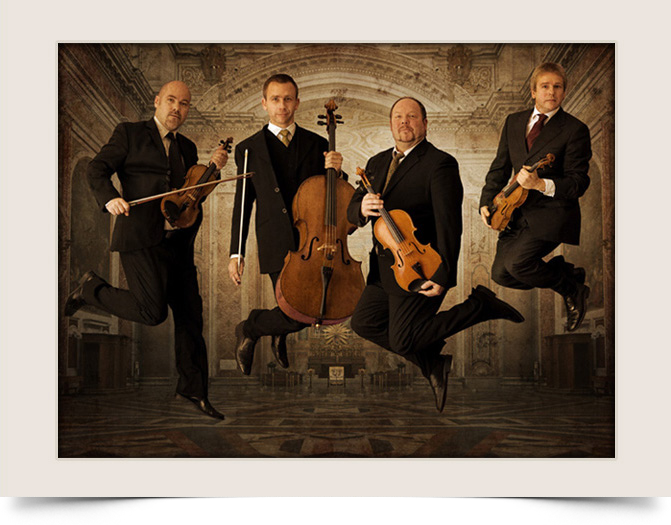 In 2009 they released their second cd with contemporary Swedish stringquartets (Phono Suecia). ”Outstanding performance” was the comment of international magasine The Strad. In 2011 the quartet started the recordings of W. Stenhammar’s complete quartets on BIS label. All Stenhammar volumes are now released and has recieved fantastic rewievs in international press.Also released this year are the recordings of Atterberg stringquartets (cpo).SQ is this season touring in Sweden, Denmark and Germany.